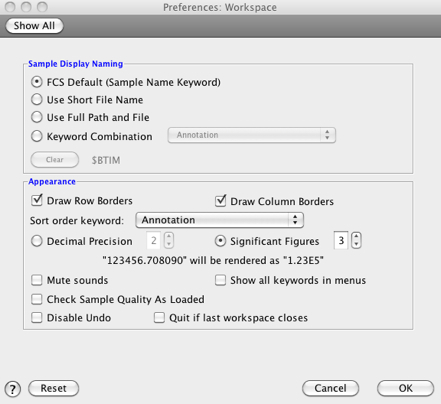 Select the Workspace button in the Preferences tool to open the Workspace preferences. shown here. Press to clear the keyword combination. in the Tools tab under the instrumentation band. Disable Undo: If checked, undo will be bypassed. May improve performance. Quit if last workspace closes: If checked, closing the last workspace will exit FlowJo.